Phillip Lindsay. Credit: Ron Chenoy, USA TODAY Sports. It has been a while since the Denver Broncos have had a running game they could hang their hat on. During the Mike Shanahan era, running backs like Clinton Portis and Tatum Bell ran wild through the league thanks to a bruising offensive line led by Tom Nalen. This season, rookie running backs Phillip Lindsay and Royce Freeman took over the Denver backfield, combining for 1,558 yards and giving the Broncos their most potent ground attack since Portis rushed for 1,591 yards in 2003. Are the Broncos set at running back for the foreseeable future, or will they look to create a three-headed monster in their backfield this offseason? 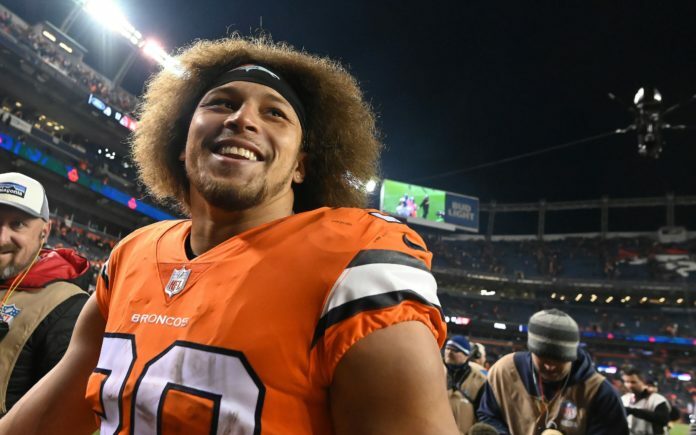 Phillip Lindsay’s hometown kid story was one of the best storylines of the 2018 NFL season. Who can’t relate to growing up, picturing yourself playing for your hometown team, pretending you are their star player? Lindsay did a whole lot more than picture and pretend on his way to becoming the first-ever offensive undrafted player to make the Pro Bowl in his rookie season despite only starting eight games. This made him the only Broncos back to ever rush for over 1,000 yards while starting in fewer than 12 games. Lindsay’s 5.4 yards per carry were the most-ever by a Broncos running back outside of Clinton Portis in 2002 and 2003. Lindsay’s Pro Football Focus grade of 81.7 made him the highest-graded player on the offense and fourth-highest graded overall (Min. 50 snaps). Royce Freeman and Devontae Booker were role players for the Broncos’ backfield, with Freeman being the more bruising power back. Freeman certainly has a strong argument to see more playing time next season, as his pass-blocking grade was the highest by far among the three running backs, and his power rushing was impressive. Freeman averaged 3.22 yards after contact per attempt, the most by a Broncos running back, and the 14th-best figure in the league among running backs with at least 40 carries. Booker was used like a third-down back and played the lion’s share of his snaps on passing downs. In fact, just over 74 percent of his snaps came on passing plays, and he lined up at running back on 34 percent of Keenum’s dropbacks. The reason Booker was used so often on passing downs, though, remains a mystery. Booker earned the second-lowest pass blocking grade on the entire team and the lowest of any Bronco with at least 250 snaps. For comparison, Royce Freeman’s was more than twice as good. Booker did grade out as the best receiver among the running backs, but not by enough to compensate for his pass blocking struggles. The only running back that the Broncos would even consider replacing at this point would be Booker, so what other third down running back options are out there? Lindsay immediately jumps off the page as an alternative for more reasons than just his body type. Lindsay was a more than dynamic receiving option for the Buffs during his time in college. He caught 117 passes for over 1,000 yards and three scores during his time at CU and flashed that ability during his rookie season. Despite not being as good in pass protection as Freeman, Lindsay still earned an above average grade of 63.1, almost 30 points higher than Booker’s. He did earn a receiving grade 4.5 points under Booker’s, but could quickly develop into a better option. The 2019 class of running backs, both in the draft and free agency, is a weak one that doesn’t really fill Denver’s need. The best third down backs available are Jacquizz Rodgers and Spencer Ware, neither of whom are big enough upgrades on Lindsay or Booker to warrant their higher price tag. The draft has some interesting pieces like Stanford’s Bryce Love or Florida Atlantic’s Devin Singletary that could be solid third down backs in the league but fall into the Lindsay mold. The Broncos have too many pressing needs to get a second small, shifty, quick running back. The Broncos should stay put with their current stable of running backs. Lindsay and Freeman’s rookie years were so fantastic, it is easy to forget that they were just rookies and they have a long road of growth and development ahead of them, but that’s the case. With a year of experience under his belt and the addition of offensive coordinator Rich Scangarello, Lindsay could easily take a monstrous step forward towards becoming a dominant player in the passing game. Scangarello comes from the Kyle Shanahan tree, which emphasizes the use of running backs in the passing game, and Lindsay already has the physical traits to do so. Also, the Broncos have needs at quarterback, wide receiver, tight end, on the offensive line, nose tackle, linebacker, and cornerback that are all farmore pressing than finding another running back. Maybe they could snag a player like Memphis’ Darrell Henderson, in the fourth or fifth round, but outside of that, it doesn’t make much sense to invest even more in the position.